The soil invertebrates inhabiting the territory of the pyrogenic succession in the oak forests, were investigated in comparison with the control plots where there was no fire within two years. The soil invertebrates’ abundance was determined from the data of field seasons (May-August of 2015 and 2016). The analysis of mesofauna was performed towards the trophic groups. Carleton, T.J., MacLellon, P. (1994) Woody vegetation responses to fire versus clear-cutting logging: a comparative survey in the central Canadian Boreal forest. Ecoscience, 1(2), 141-152 (in Canada). Devyatova, T.A, Gorbunova, Y.S., Lavlinsky, A.V. (2014) Modern evolution of soils and flora of the forest-steppe of the Russian plain after forest fires. Voronezh, Scientific book, 259 (in Russia). Ehnstrom, В., Langstrom, В., Hellqvist, C. (1995) Insects in burned forests forest protection and faunal conservation (preliminary results). Entomologica Fennica, 6, 109-117 (in Finland). Gilyarov, M.S. (1965). Zoological method of soil diagnostics. Moscow, Nauka (in Russian). Gorbunova, Y.S., Devyatova, T.A., Grigoryevskaya, A.Y. (2014). Influence of fires on the soil and vegetation cover of the forests of the center of the Russian Plain. Bulletin of Voronezh state university. Ser. Chemistry. Biology. Pharmacy, 4, 52–56 (in Russian). Hanula, J.L., Wade, D. (2003). Influence of long-term dormant season burning and fire exclusion on ground-dwelling arthropod populations in longleaf pine flatwoods ecosystems. Forest Ecol. Manage., 175, 163–184. Jacobs, K.A., Nix, B., Scharenbroch, B.C. (2015). The Effects of Prescribed Burning on Soil and Litter Invertebrate Diversity and Abundance in an Illinois Oak Woodland. 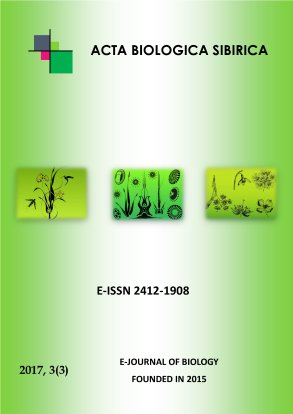 Natural Areas Journal, 35(2), 318-327. Kauhanen, H. (1995) Fire and Forest dynamics in Kola Peninsula. Research in eastern Europe to solve nature conservation problems in the Nordic countries. Uppsala (in Sweden). Melekhov, I.S. (1980). Forest Science: Textbook for high schools. Moscow (in Russian). Rubtsov, S.S., Negrobov, O.P. (2014). Pyrogenous succession of the mesofauna of the Usman boron of the Voronezh region. Proceed. XVII All-Russian Meeting on Soil Zoology. Creativity of scientific publications of KMC (in Russian). Vincent, K., Moening, K., Colter, H. (2009). Effects of annual fire on the litter fauna populations and soil compositions of an upland white-oak forest. Tillers, 2009, 6, 17-20. Wikars, L. (1992) Forest fires and insects. Ent. Tidskr, 113(4), 1-11 (in Sweden).